The network configuration has been changed completely with Ubuntu 17.10. A new tool named Netplan has been introduced by Canonical (the company that develops the Ubuntu Linux distribution) for network setting management which will be used in all new Ubuntu versions starting with the 17.10 release. The former network configuration file /etc/network/interfaces is not used anymore. Here the steps to configure a static IP address with Netplan. The Netplan configuration files are located in the directory /etc/netplan/. The default configuration file is /etc/netplan/01-netcfg.yaml. The configuration syntax is in Python programming language (.yaml format), so the indentation of the lines is important! Here is an example of a static IPv4 address 192.168.1.100 on the first network interface ens33 and gateway IP 192.168.1.1. The server will use the free Google DNS servers 8.8.8.8 and 8.8.4.4 to for name resolving. It is important that you wrap the IPv6 address into single quotes, you will get a syntax error otherwise. Or use it with the –debug switch to get some useful output if parsing of the netplan config file was successful. 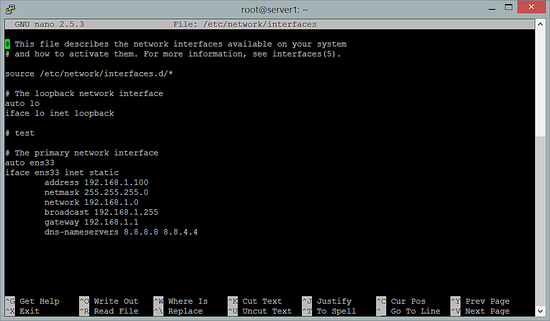 Here is the configuration to get the network configuration for IPv4 and IPv6 from a DHCP server. Netplan is a complex new configuration system to configure network cards, virtual devices, VLANs and bridges in Ubuntu 18.04. For more examples and an in-depth explanation of the syntax, see the man page. You can copy and paste directly from this line. Ubuntu Systems with systemd (like Ubuntu 16.04 and newer), the network interface is named ens33 instead of eth0 now and the word ‘dynamic’ has been replaced with ‘dhcp’. And here the complete network configuration file from an Ubuntu 16.04 system. If you use “nano” editor to edit the configuration file, type Ctrl+x to save changes. Save modified buffer (ANSWERING “No” WILL DESTROY CHANGES) ? Changes in /etc/resolv.conf are required only on Systems with Ubuntu < 14.04, for newer Ubuntu versions the nameservers get configured in the /etc/network/interfaces file. In this step, you will manually configure your dns configuration file. If you use “nano” editor, type Ctrl+x to save changes. Open the /etc/network/interfaces file again and add a line dns-nameservers 8.8.8.8 right after the gateway line. The nameservers 8.8.8.8 and 8.8.4.4 are provided by Google for public use, so you can use them in your network configuration. Manually restart your network interface with the new settings. If everything is correct you will get this result. The hostname of an Ubuntu Server or Desktop is being configured in the files /etc/hostname and /etc/hosts. The /etc/hostname file sets the actual system hostname while /etc/hosts is used for the local name resolution. In this example, I will change the hostname of my system to obelix.example.com. Here a screenshot of the hosts file. Finally, restart the system to apply the hostname change.